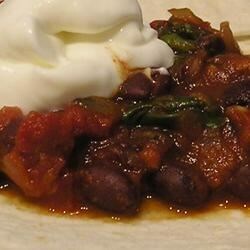 "Tomato, chopped spinach & kidney bean mixture wrapped in a 10 inch tortilla." Heat oil in a large skillet on medium-high heat. Saute onion and garlic for 5 minutes. Stir in chili powder and cumin, and cook 1 minute. Stir in water, tomato, kidney beans and salt. Bring to a boil, then reduce heat and simmer for 20 minutes. Stir in spinach and cook 5 minutes more. Spoon 1/4 of the bean mixture into the middle of a warm tortilla. Wrap and garnish with avocado, sour cream and salsa. I didn't make the recipe because it has so much fat and calories. It sounds delicious. I will try it but I will cut out the fat. Any suggestions for a lighter version? Very delicous but also very healthy. I substitued canned black beans for kidney beans. This was really good. I sprinkled the tortillas with cilantro leaves before filling and then added cheddar cheese on top before rolling up (although this adds more calories).